Yes, of course buying a home is a big time dream and if one can get its ideal home, then it is more than an achievement because buying a home because securing secure. But, is it true that every property is secured? Actually, it is not because when it comes to property selection it is important to check every aspect so that the investment never turns into a fiasco. If we talk about the aspects, then it is important to say that the reputation of the builder in the market is important to check, make sure that project is located at an approachable distance and then you can compare the property, if you find attractive pice, high modern amenities and intelligent home space, then you can go for it. So it takes certain responsibilities while you are investing in property. Now it is a right time to move towards the property that is gleaning high level attention because it is ready to move property. You also have to understand that ready to move property is much in demand because in this case you don't have to wait for possession and you get what you see. So if you are planning for it, then ready to move property will work brilliantly for you. DLF LTD a big name behind top notch developments where they have given every important element to make the project one of its own kinds. DLF Crest- An Ultimate residential project that serves the best lifestyle. Yes, every project is beautiful and worth in its own way, but when we pick such international based homes, then there is no room for doubt. You need perfection, standard, class and prominent way of living a life. 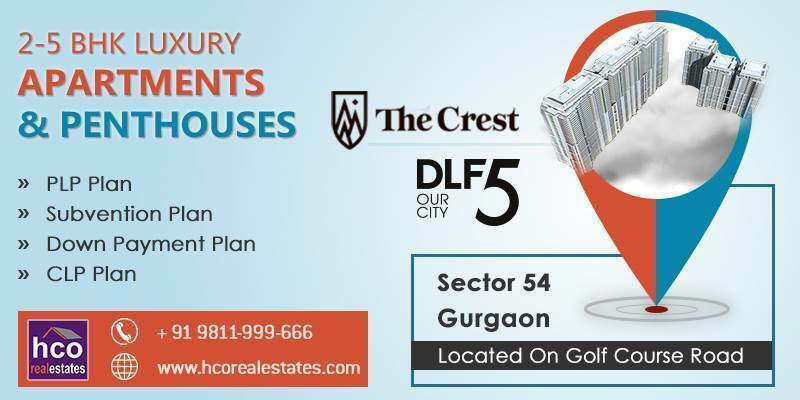 So if you really want to experience that unseen lifestyle, then surely, DLF Crest is the best place to grab. In this project, you get the perfect mixture of 2, 3 and 4 BHK Apartments and 4 & 5 BHK Penthouses dotted over 8 acres of area where every single apartment works greatly in order to bring a smart way of living a life. These roomy apartments make your living grand, high availability of amenities like pool, gym, spa, jogging track, clubhouse, sports area and more make an active ambience for every resident, then its location in sector 54, Gurgaon makes the travelling completely comfortable and last and important, builder DLF LTD comes with full security system where you live a tension free life with your family. You know this already that Gurgaon is a birthplace for biggest IT hub and where you get all dreams jobs and living here makes the entire lifestyle manageable and smooth. So think less and take a lucrative step that spurs the level and let your family experience something new and swaying.